Taste test: Yogurt and green onion seems to be the health food generation's answer to sour cream and onion. But I don't know how anybody ever came up with the idea of putting yogurt on a potato chip. 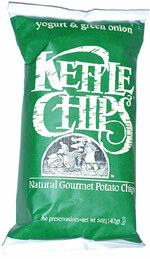 Having said that, these are really good chips, regardless of what you call them. They're dark, thick, crisp, crunchy and quite tasty. Smell test: Very potatoey, somewhat oniony aroma.